Today’s well-designed kitchen often deserves the title of functional art, taking as its main inspiration the lifestyles of modern families. Designers must find ways to express aesthetically pleasing themes with cooking necessities, computer equipment and child-friendly furnishings. The hub of the home, kitchens are where everything must happen. While many homeowners are still dreaming of how to make this command central area operate smoothly, today, see how parents of two young boys took action by imagining what would be ideal for them and assembling a creative team to make it a reality. One of the most distinctive design choices in this kitchen is the use of floor-to-ceiling subway tiles. They brighten the space, add modern appeal and they are extremely easy to maintain. Dark colors were chosen for cabinetry, more forgiving of little boys’ fingerprints. Granite—covering all countertops and the home office desk—is ideal for attractive, yet maintenance-free living. In addition to creating gathering areas and efficient workspaces for this family that emphasize “utility and movement,” Rachel says the homeowner’s South American background presented a plentiful source for ideas when choosing colors and textures. One of the most eye-catching furnishings in the room is a banquette upholstered with a custom rag-weave rug. This banquette is upholstered with a custom rag-weave rug. Grand-sized drawers are used for quick, tidy storage. Also in this corner, a custom table by Rachel Gray and Bernar Balink, designed for function and versatility. Another pivotal piece in this corner is a table, co-designed by Rachel and Bernar Balink. Bernar constructed the table from oak with walnut banding. 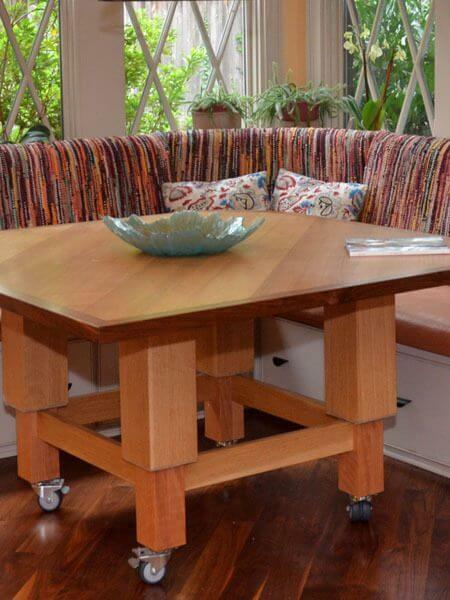 Curved edges soften the design, and casters enable homeowners to move the table easily when they choose to convert it into a coffee table; two simple motions change the level of the tabletop. A subtle feature of this versatile custom table is the placement of wood on the tabletop, which reflects a 45-degree angle of walnut floors throughout the kitchen. This 45-degree placement keeps the eye moving and unifies separate areas in the kitchen. Walnut wood floors, Brad explains, are rich in their natural color and texture and add warmth to the room. The placement of wood on the tabletop reflects a 45-degree angle of walnut floors throughout the kitchen. This subtle feature keeps the eye moving and unifies separate areas in the room. The homeowners wanted dark colors for cabinetry, which would be more forgiving of little boys’ fingerprints. Floor-to-ceiling subway tiles brighten the space, and while their appeal was initially originality and appearance, the homeowners soon figured out that they are extremely easy to maintain. Also, glass-front cabinets and the elimination of hardware and knobs on top cabinetry make for a sleek wall of texture and color. Granite—covering all countertops and the home office desk—is also ideal for attractive yet maintenance-free living. Most storage is in the form of drawers, which are highly compartmentalized for one of the parents who loves to cook, often on short notice for family members and friends of all ages. Rachel and Lee Googe of Graham’s Lighting collaborated on adding the proper lighting. Industrial-shaped globes over the kitchen bar, natural light through Tudor-style windows and ample recessed lighting create a variety of moods for an action-filled room. Take note of a silver service placed next to everyday kitchen tools. We all have silver under lock and key that needs to come out more often. Click here to read about Everyday Uses for Your Sterling. 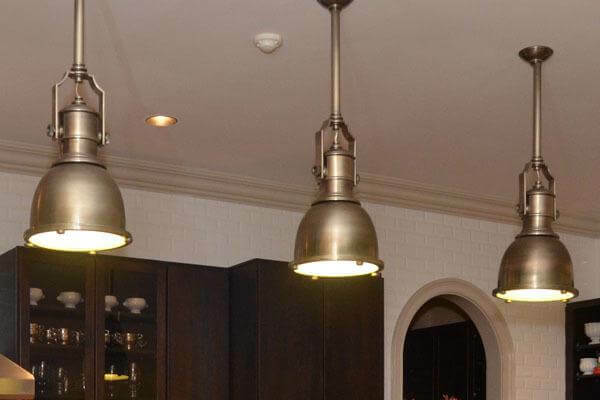 Rachel and Lee Googe of Graham’s Lighting selected Industrial-shaped globes to light the kitchen bar area. This sleek desk chair was supplied for staging by Samantha Hamner of the Spaces Group. Overall, this living space emphasizes an indiscrete, open design. From the main kitchen to a home office to the breakfast table niche, throughout the seating area and extending to the backyard, children can be viewed clearly—an important safety feature for the homeowners. Brad McMillin points out that richness of natural materials and making the ceiling in the kitchen lower in height than the ceilings in the rest of the home contribute to the coziness of the space. Areas are distinct according to purpose, but unified and consistent with each other through repetition of shapes and materials. Brad points out that richness of natural materials and making the ceiling in the kitchen lower in height than the ceilings in the rest of the home contribute to the coziness of the space. Up close, objects appear modern and angular, functional and sleek, but the sum of this kitchen’s individual elements is warm, traditional and welcoming, truly representative of this family’s lifestyle and personality. And thank you to Whitney McNeill for today’s kitchen photos!